A superb, luxury villa set in a backdrop of mountains, with countryside and sea views. Relax in the swimming pool under the night sky and take in the aromas of nature our villa has to offer. Peach, lemon, orange trees, vines, Plum tree surround the villa in a peaceful location and it is perfect for contact with Mother Nature. Villa Isabel is located in the idyllic village of Parragil, only a 15 minute drive to warm sandy beaches and 20 minutes to Alte. In the center of Parragil, you can find cafe and 2 small food shops. The Portuguese traditional town market of Loule is a 5-10 minute drive, where you can find traditional restaurants, bars, banking, post office facilities and shops. The castle and all monuments, Mae Soberana church is located at the top of a hill which has amazing 360 degree views of the mountains, town and sea. Welcome/Benvindo- We are Isabel and Paulo the owners of Villa Isabel, a friendly Portuguese couple and we have lived in London for 15 years.We have a good thorough insight into the area surrounding our villa and the closest towns, villages, beaches and all other amenities. We are very flexible with our guests requests and are always happy to help. As we live in London we can provide the villa keys to our guests (from London or close surrounding areas, meeting them if they wish) or otherwise by meeting our maid at the villa. In a quite residential area, in the village of Parragil our villa provides a peaceful and happy break, we love the green surroundings of the area and the feeling of being close, but far enough away from the crowded towns. The easy access to the motorway A22 and N270 can take you to all places of the beautiful seaside and countryside of the Algarve. Our Villa offers you a very private location, where you can rest in complete privacy. In our pool the guests can relax with the most wonderful views. There are unique spots at the top of the villa, at the back, the luxurious pool has shower facilities, two terraces where you can relax. Shared bathroom to bedroom 1 and bedroom 2 with bath, wc and bidet. En-suite bathroom to bedroom 3 with shower, wc and bidet. Lounge/dining room with air conditioning, leather sofas, 55 inches Smart TV with Sky+, all channels,Blue-ray/Dvd player, Stereo System, WiFi. Dining table and seating for up to 8, coffee table and a variety of books videos and games for your use. Fully equipped, spacious modern kitchen with washing machine, fridge, cooker, microwave, dishwasher, toaster, electric kettle, breakfast bar area, filter coffee machines. UK Premium 60 Channels+ Sports Pack: Sports Pack: Sky Sports 1,Sky Sports 2,Sky Sports 3,Sky Sports 4,Sky Sports 5,Sky Sports Formula1,Golf Channel, Eurosport1,BT Sport1,BT Sport 2. The best Algarve courses are within a short drive, Vila Sol, Vale do Lobo, Quinta do Lago and Aldeia das Acoteias are all within around 25 minutes drive from the villa. Wheelchair accessible to the Villa from the back door or to the from door if you go round the house, indoors there is no stairs or steps. Although, there is no access to the poo lwith wheelchair. Our pool is for sole use of our costumers. Notes on accommodation: The air-conditioning is a remote controlled unit, therefore can be set to each rooms preferred temperature. We have a safe in the villa, where our guests can keep their valuable belongings. Our Villa have the Local Turism Certificate approved by the local Council. Outside: Plenty of sunbathing and natural shade in the Swimming pool area, sun loungers are provided with cushion pads. Large barbecue areas with 2 alfresco dining tables are at the rear of the villa. At the front of the villa is a landscaped garden, where you can enjoy your day and the beautiful night views. On site parking is available for up to 2 cars and additional parking outside the property. Utility Room: New washing machine, tumble dryer, fridge/freezer, iron and ironing board. All swimming pool facilities are in this room. Cleaning / Towels / Linen / Maid service: Clean towels and fresh linen are provided and changed weekly, however laundry facilities are provided for your use. Maid service is available on request at an extra service charge. Other: Swimming pool for sole use of guests, 28 ft long by 16 ft wide,Patio with BBQ facilities.Large Parking with gated driveway, Security gate to swimming pool access. A terrace on the front of the house with garden where you can enjoy a relaxing evening. This is a nice 2 BR 2 Bath house with a well-stocked kitchen. We had a bit of an issue figuring out the stove. It would be nice if the owner would make up a little welcome sheet with instructions for things like the stove and the wifi password, trash pick-up, etc. We worked it out. Great biking in all directions and an easy drive to the coast if you want to play tourist. Stayed for 10 days in Villa Isabel. Lovely villa, the pool area is excellent. Loule is close by - a lovely town with good places to eat. Thank you Isabel & Paulo for letting us stay. We had a wonderful time at Villa Isabel. I have stayed in the Algarve many times but this was a real treat. Everything went well. If your thinking about booking it's worthwhile as the owner is genuine. Nice holiday house, would not call it a luxury villa. Nice location, great pool and garden. Kitchen and bathroom were not very clean. Greasy cupboards , no cleaning products. Would be nice to have some cold water in the fridge when you arrive, costs only 20 cents.a bottle. Isabel was very kind and responded quick on our questions. Our Villa is,always cleaned after every check out and deep cleaned every 3 months by a cleaning company which we are replacing for a new one. We leave minimal cleaning products for costumers use on their stay. We are dealing with a local store to provide a basic welcome baskets for costumers on their arrival. This villa is perfect for visiting Portugal. There is plenty to visit within a half hour's drive. The beaches are great and the scenery is beautiful. The shops are about 20 minutes away and are well stocked. The outside of the villa is it's best asset. The pool and upper gardens are particularly good. The views are amazing and we spent many hours reading by the pool and observing the views. The general organisation could be better. The 'maid' didn't turn up when we arrived, so I had to telephone Isobel to get the key code, so ensure you have Isobel's number. The villa wasn't particularly clean, so we had to spend an hour cleaning the bathroom sinks and toilets and the kitchen as soon as we got in. It would have been nice to have a small welcome pack of water, milk, tea and juice (for the children). After several hours of travelling, the last thing you want to do is go shopping after you've walked through the door. My advice would be to visit the shops before you get to the villa. The 'maid' never answered her phone when we telephoned her during the two week stay, but thankfully Isobel was able to answer our questions or sort out any problems. We got most of our local information from the visitors' book. A pack of information (like in many other villas) detailing the shops, best beaches, tourist attractions, medical facilities (just in case) etc. would have been very useful. With a bit of organisation and planning, I could have graded this with 5 stars! Thank you, for your review. The maid didn't turn up as she only clean the Villa or go there for any request related to the villa if our costumers need a maid to help them during their stay they need to request her private services, on extra payment, its not include on the price of the Villa, as we supplier the facilities necessary for the guests. A "welcome basket" is not provided by us, but on request we can happily get one to our guests. We have already in place, a guests guidebook on the Villa which can hopefully help our guests on many ways on their holidays. There are the warmest sandy beaches in Portugal within 15-20 minutes drive from the villa.10 minutes drive to Vilamoura where is one large marina, where there is a variety of bars, shops and traditional restaurants. You can take the way to the small Algarve paradise islands (like Ilha da Culatra, Ilha do Farol, Ilha de Tavira or Ilha de Faro, to where you can drive and enjoy the amenities), to most of them you need to take boats, which are every half hour in the Summer time. 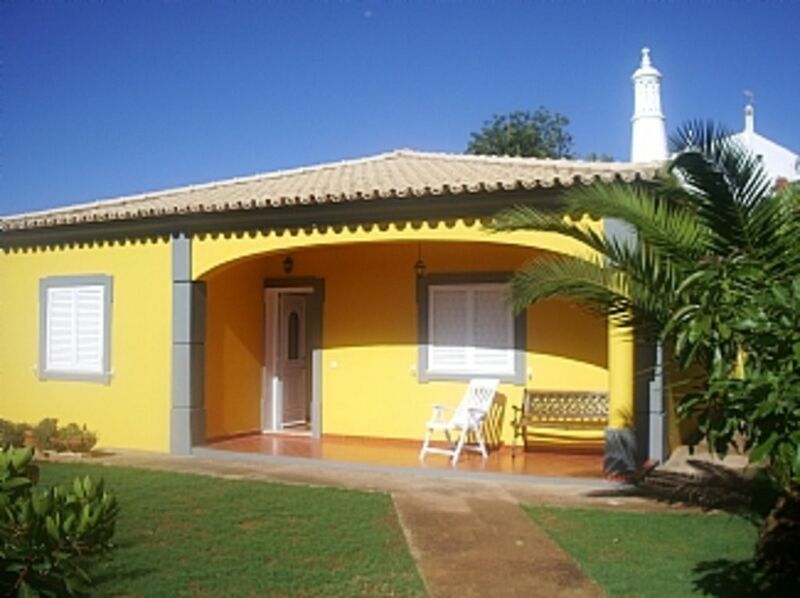 From the villa you are 1 hour drive from Spanish border, and very close to A22 the quickest route access to East or West to explore the Algarve. The road to Benafim take you to the countryside, to Alte and Salir gorgeous old villages, with plenty to explore. And in Rocha da Pena is an amazing rock formation, where you can enjoy a mountain walks and experience rock climbing. Loule is the closest town to explore 5 minutes drive. For buzzing nightlife Albufeira is only 20 minutes drive. There are water park, and ocean park within 20 minutes drive. In Vilamoura discover the Algarve Coastline in a daily delight. Summer cruises (10 minutes drive). Car hire essential. Villa Isabel is set in a quiet urbanization of Villas in the Village of Parragil ,near Loule, Algarve.Our neighborhood are very friendly and helpful.In the center of Parragil are traditional cafes, and small food shops.In the top of the hill there is a very old Wind mill with 360 degrees views. In Alfontes Village (about 2miles) there is the Coopers bar which is cozy to enjoy. For a great wild life walks in the mother nature, Rocha da Pena is a must to visit (9miles). We are in a short distance to Vilamoura and Quarteira,where you can enjoy the greatest beaches and restaurants in the Algarve coast. AquaShow is the biggest amusement water park in the Algarve,where you can have a fun and amazing day,is set in Quatro-Estradas,Quarteira (6miles).Sao-Bras de Alportel, ( 13 miles) worth a visit ,and the traditional restaurant,Churrasqueira Paraiso ( Luis dos Frangos), have the Best Portuguese fish and meat grill food. In Loule, Vilamoura or Quarteira you can find all sort of Banks which one is Barclays . We have parking for up to 4 cars,in the property. To rent our Villa our guests need to rent a car ,to get in and around. We can provide a link with a suitable prices,to pick up/drop off on Faro airport. Booking Notes: 25% booking deposit in advance no returnable, full payment 4 weeks before departure. A £200 refundable breakage deposit is required. Changeover Day: Flexible.